Limburg an der Lahn, and Sainte Foy lès Lyon. 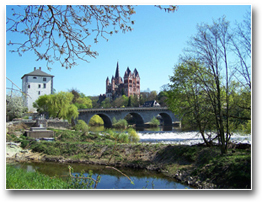 Limburg an der Lahn is an historic town, some 35 miles north of Frankfurt and close to the Rhine valley. It boasts a fine ancient cathedral, and the congregations of the cathedrals of Lichfield and Limburg maintain close links. Sainte Foy lès Lyon is slightly smaller than both Lichfield and Limburg. It is only three miles from the centre of Lyon, (the second city of France) but is a community in its own right. The town grew as a haven from the industry of Lyon, as it is set high above the city, and there are some wonderful panoramas of Lyon and the surrounding area, notably from a park known as the 'Esplanade de Lichfield". Lyon is said to be the city of three rivers - the Rhône and Saône rivers which converge there- and the Beaujolais! 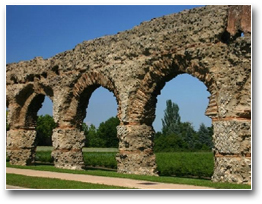 Sainte Foy's finest historic asset is remains of a Roman aqueduct and there is a fine seminary, steep narrow walled streets, parks and gardens, and squares in the town centre. Further information about the twin towns is available in Lichfield Library , where there are daily newspapers from Limburg and Sainte Foy. There are also many books in the library's collection, which have been presented to the city by the twin towns. 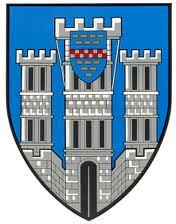 Every second year it is the turn of one of the towns to host the town twinning weekend. These weekends act as a focus, and provide a springboard for creating new links between the three countries; the Twin Town Orchestra developed from one such occasion, the Lichfield and Limburg scouts now have a strong link and for several years have organised international camps, and this year Lichfield is welcoming choirs from both twin towns and schoolchildren from Sainte Foy. Naturally friendships and contacts made over twinning weekends continue throughout the year, with visits being made to friends abroad, often combined with a holiday.